Tim Webb from Palm Tree Lagoon and his friend Adam started their days stingray fishing at the Mae Klong River in Thailand. After travelling downstream they were soon fishing for Giant freshwater stingrays on a wide section of the Maeklong River. With baits deployed at various spots across the river the anglers did not have long to wait for action. On winding down into the unseen stingray the heavy duty stand up rod was pulled firmly towards the water as battle commenced. The Giant freshwater stingray from the onset displayed large amounts of power towing the boat upstream on numerous occasions. Tim took the first turn to battle the stingray which lasted over four hours before he handed the rod over to his companion. 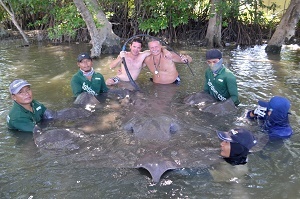 Adam continued the gruelling task of bringing the Giant freshwater stingray up from the depths as it continually clamped onto the bottom with unmovable force for long periods of time. With the battle now over eight hours the anglers worked in unison to bring the Giant freshwater stingray off of the botttom. After almost nine hours of fishing time had elapsed the Giant freshwater stingray was finally brought off of the riverbed into mid water where it slowly used its immense size to slow its ascent to the surface. Exactly 8 hours and 55 minutes after hooking the stingray, the giant freshwater stingray was finally brought to the surface and netted. The stingray was quickly transported to the riverside where it was allowed a short period for recovery. With a width of 2.24m and length of 4.38m from tip to tail the Giant freshwater stingray was estimated to weigh 250-270kg’s. The Giant freshwater stingray was released shortly after and swam away strongly into the Mae Klong River.